Thanksgiving is right around the corner, and those of us who contribute dishes to the annual family feast are probably searching for recipes right about now. I do have some tried and true dishes, but I hate making the exact same thing every time. Even though I only eat turkey, cranberry sauce, stuffing, etc., once a year, I like to mix things up a bit. We do have green bean casserole every year. It isn't one of the things I grew up eating, but any excuse to eat those french fried onions from a can is a good excuse. Especially when one can pretend they're part of a "healthy" veggie dish. Even better than onions are fried shallots, which come in a big plastic container at most Asian supermarkets (I got mine at Great Wall in Catonsville), because they are (I think) more versatile. I have to admit using canned soup in the green bean casseroles of my past, mostly because I'm too busy with other stuff to make soup from scratch. But while it does dirty another pot, I have discovered that it makes for a much more delicious final dish. In other words, it's worth the effort. It actually doesn't take that long to make a white sauce, and it can be flavored any way you wish. Omit the mushrooms entirely and add fried onions, instead, or a big pinch of chicken bouillon powder (you probably won't need additional salt). Season your sauce with a variety of herbs and spices--curry powder is delicious here--or go as plain as you wish. You can also control the calorie count in the sauce by using 1% or 2% milk. The sauce won't taste as rich, but it'll still be very good. 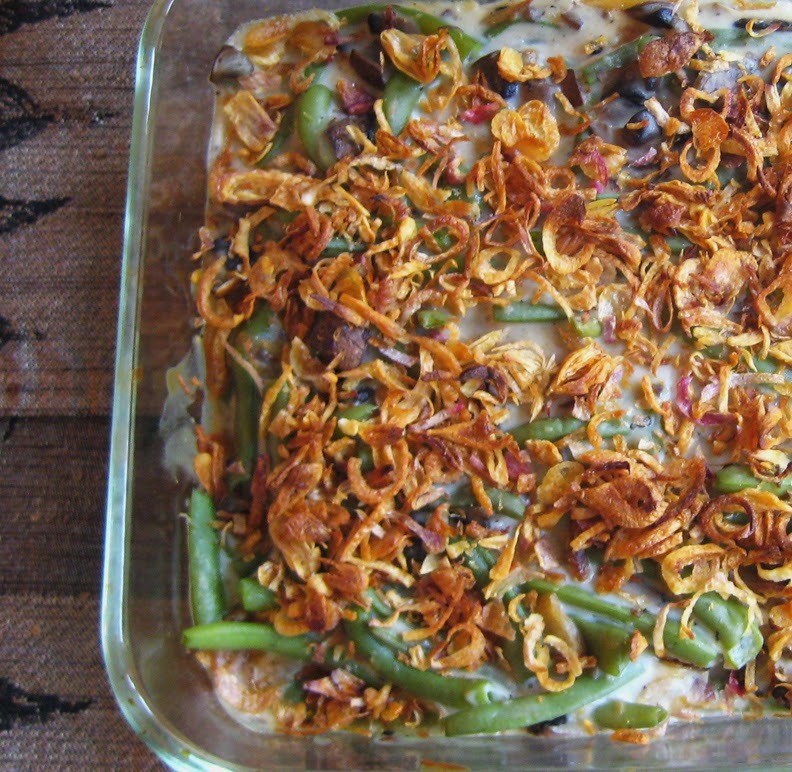 And for goodness sake, don't save green bean casserole for the holidays...eat it all year 'round! We eat it over steamed basmati rice. Cook the green beans in boiling salted water until tender. Drain and rinse in cold water. Set aside. Remove stems from mushrooms, trim cut end, and chop the rest. Scrape the gills out of the mushroom caps with a spoon. Rinse caps to remove any extra gill goop/dirt. Dice the caps. Place diced caps and stems into a 2 quart saucepan with a glug of olive oil and a big pinch of salt. Cook over medium-high heat, stirring frequently, until mushrooms are tender and there is some juice in the pan. Add the butter and stir until melted. Stir in the flour. Cook the resulting paste, stirring constantly, for 2-3 minutes, to remove the raw flour taste. Stir in the garlic and cook an additional minute. Pour in the milk. Bring to a boil, stirring gently, then turn down the heat a bit. Season with thyme, salt and pepper, and cook until thickened. Remove sauce from heat and add cooked green beans and 1/2 cup of the fried shallots. Stir well to combine. Pour mixture into an 8x8 square baking pan. Top with remaining shallots. Bake at 350 for 30 minutes, until bubbly. Serve as a side dish, or eat over rice.